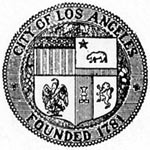 Fire Commissioners of the city of Los Angeles, California. New equipment includes the building and placing into commission of Fire Boat No. 3, a boat much smaller in size and capacity than Fire Boat No. 2, but a piece of apparatus which is filling a real need in the Harbor district. It is a wooden boat of the cruiser type, 40 feet in length with 10-foot bean, motored with Sterling-Dolphin engine, and will deliver 200 gallons of sea-water per minute at a nozzle pressure of 125 pounds. Draft of boat is 2 feet 6 inches. This gives the boat access to any section of the Harbor, and the speed and ease of handling makes possible a prompt response of the craft to any alarm of fire. In addition to the ordinary fire-fighting equipment, it is supplied with CO2 extinguishing apparatus, making available for the first time by this Department this gas which has proven itself so effective in certain types of fires, particularly fires which occur in the holds of ships. Four connections are provided for 2 1/2-inch lines. It was built by Fellows & Stewart Company, Washington, at a contract price of $7,600.00. Extra equipment and other incidentals not foreseen at the time of contract brought the total cost of the boat to approximately $10,000.00. The boat was officially launched March 15, 1928 and accepted by the City on March 22nd. At present the boat and men are stationed at quarters of Fire Boat No. 2. Fire Boat No. 3 was built by the Fellows and Stewart Shipyard at Wilmington. The boat was built as an auxiliary to Fireboat 2 and was moored alongside Boat 2's quarters. Launched March 15, 1928 and commissioned March 22. All wood construction. Length 38' 4", beam 10' 2", draft 2' 6", powered by 275 H.P. Hall Scott Invader. This engine also drives the Byron Jackson centrifugal pump -290 G.P.M. at 125 pounds pump pressure through three outlets and a foam generator. The fuel capacity is 185 gallons. Fire Boat No. 3 carries a foamite generator and 8 cans of foamite powder, MSA hose mask, grappling and drag hooks, 10' roof ladder, two 50 lb. CO-2 tanks with pin nozzle, two type "D" CO-2 and 28 life jackets. Fireman Joseph V. "Rocky" Roquemore, alone aboard Los Angeles' Fireboat No. 3, single-handedly rescued 17 sailors and workers who had jumped or were thrown into the water when explosions and fires erupted from Navy landing craft and a wooden dock on October 21, 1944. The $10,000 boat, commissioned March 13, 1928, was wooden and gasoline-powered; further adding to the dangers Roquemore faced during his rescues which remain unparalleled in the history of the Los Angeles fireboat fleet. The boat, mainly intended as an auxiliary to Fireboat No. 2, was decommissioned, July 28, 1967 and sold.